Total employment contracted by 8,500. 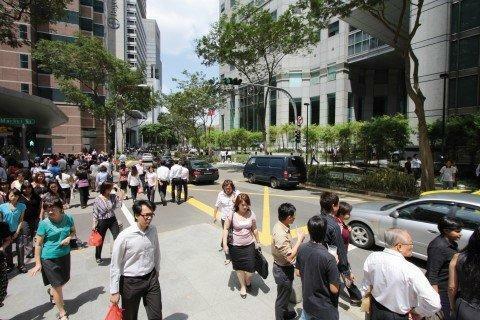 Singapore's has seen the worst case of employment declines in the first quarter of the year, with 8,500 job losses incurred. According to Citi Research, this is the highest since the SARS epidemic in 2002-2003. The decline was led by the construction sector, which reported 12,900 job losses. There was also a 4,400 contraction in the manufacturing sector. The contraction is due to a decline in Work Permit Holders. On the other hand, services employment continued to grow at 8,700, though growth was slower than the first quarter of 2016 at 13,200. Meanwhile, the first quarter unemployment edged up to 2.3%, with resident and citizen unemployment unchanged at 3.2% and 3.5%. Resident and citizen unemployment rates remain at the highest levels since 1Q10 and 1Q09, respectively. Citi Research said this suggests stronger external demand in the past two-quarters have yet to provide any meaningful uplift to labour demand, with even manufacturing continuing to shed jobs. "This corroborates MAS’s expectations for labour market softness to remain in the near term, as its labour market pressure index edged down to levels not seen since 2009. This would in turn lead to the persistence of the two-speed economy. As such, a further uptick in unemployment in 2017 would likely be fully anticipated in MAS’s baseline projections, and we sense that MAS may implicitly expect resident unemployment possibly rising to 3.5% in 2017," Citi Research said. However, we sense that MAS also probably sees a corresponding rise in NAIRU to around 3% (2016: 2.5%), such that the unemployment gap should not widen significantly. Expectations of a higher NAIRU would be reasonable given skills mismatches amid ongoing restructuring in the economy. As mentioned in our recent note, dovish guidance in the Macroeconomic Review suggests MAS is in no hurry to normalize policy, even if it has a fixed time frame to do so. Tightening could be brought forward if data points to 2017 GDP growth decisively breaching 3%, broadening beyond export-oriented sectors, with labour market slack diminishing, which could result in core CPI converging towards 2% more quickly than anticipated.